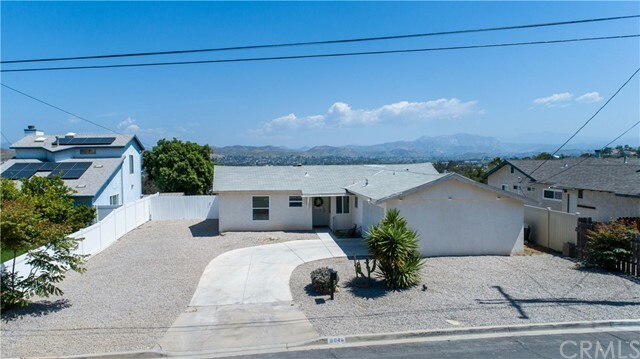 All Santee homes currently listed for sale in Santee as of 04/24/2019 are shown below. You can change the search criteria at any time by pressing the 'Change Search' button below. "Immaculate 4 Bedroom Home in a private cul-de-sac nestled in the Hills of Santee features a Sunroom, beautiful custom kitchen with granite counter tops, Solar Panels, beautifully landscaped with mature fruit trees, water fall pond.Pride of ownership. Close to Schools, Walking Trails, Shopping Centers. Easy access to Freeways. Neighborhoods: Courtney Lane Equipment: Fire Sprinklers,Garage Door Opener Other Fees: 0 Topography: LL"
"Fully updated & remodeled! Open floor plan with modern amenities.New roof, new hardwood flooring; new quartz countertops w/Kohler fixtures, new bathrooms. New water heater, new recessed LED lighting throughout. Landscaped front & backyard. Absolutely turnkey. A home you'll be proud to share with family & friends.Lots of entertaining options with large enclosed backyard. Walking distance to Santee Lakes, schools, schools, restaurants, churches,shopping.Furn pack available.Appliances convey.Must see!! Neighborhoods: Carlton Hills Equipment: Dryer,Garage Door Opener, Shed(s), Washer Other Fees: 0 Sewer: Sewer Connected Topography: LL"